Volkswagen presents their electric beach buggy concept vehicle modelled on the legendary Meyers Manx dune buggies from the 60s and 70s. The German carmaker set the debut in March this year. In December just passed, it was already rumoured that Volkswagen would be making a version of the iconic Manx Beach Buggy. Volkswagen has confirmed that the concept vehicle will be based on the modular platform (MEB). True to the original style, this new buggy has no conventional doors or fixed roof, while its overall look is characterised by the free-standing wheels fitted with off-road tyres and open side sills. 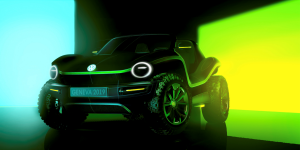 The fully electric concept beach buggy will be revealed at the 89th International Geneva Motor Show (7 to 17 March 2019). So far Volkswagen has not released any technical details nor production plans.